This is the story of how I realized I was a grown up. Which, wouldn’t seem like such a big deal… but it is… BECAUSE THERE WERE NOT DIRECTIONS TO FOLLOW. I just made it up. Yes. You read that correctly… I, Betsy, the girl who one year ago had rarely used the oven to make anything harder than cake from a box… made it up. I looked at it. Thought through what it probably needed. And then I just made it. And are you ready for this? It was incredible. Which, is why I can call myself a grown up. Because, confession time, I’ve thought this to myself before and then it’s turned out terribly. And those things I don’t blog about, because it’d be embarrassing to confess that I combined rice, green beans, cream of mushroom soup and tuna and thought that it might end up the best new recipe of all times (news flash: that’s a terrible combination, do. not. try. that. at. home). So, I choose to keep most of those (clearly not that one) to myself. But this time. I won. And since your life on the interwebs needs to look perfect… I am here to brag about how genius I am. Kidding. I’m not that girl. But I AM the girl who wants you to know about this because it’s freakishly easy and totally delicious. 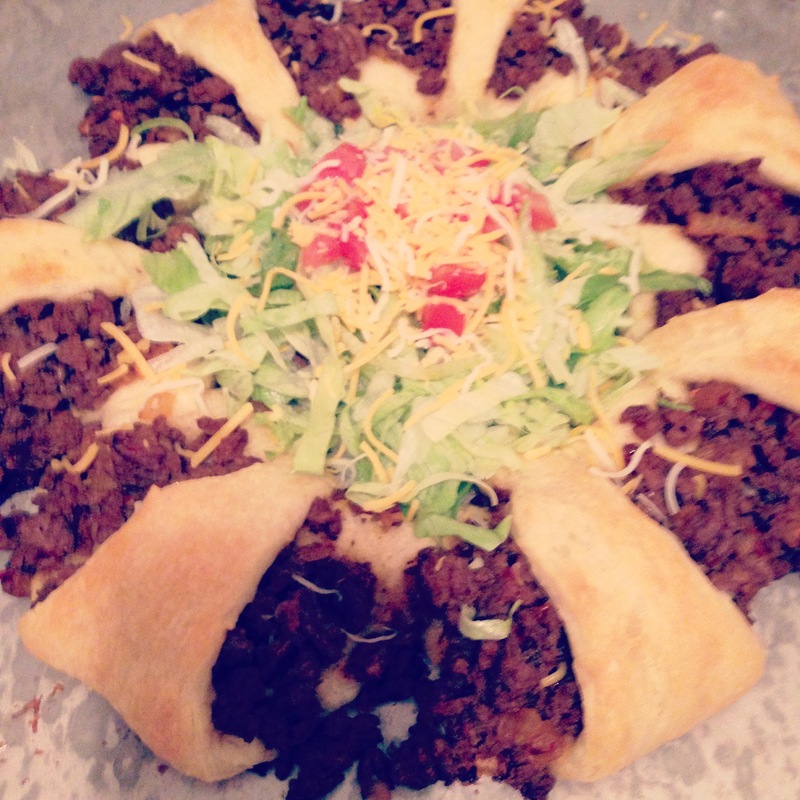 And you will thank me for it being like a taco salad combined with a Runza. Yeah, I said it. Go with me here, you won’t regret it. I’ve convinced you right? Yuuuuuuuuuum. Thanks Instagram for making my photos cooler than they really are. Yeah. And the great news? It’s real easy. Cool Bets you’ve been rambling for a while now, let’s get to the point shall we? Two cans of crescent rolls. I used just one, but to really overlap the triangles more all while making it more carb-filled and delicious, I’ll use two going forward. A packet of taco seasoning. Lettuce, tomatoes, cheese, sour cream… or whatever else you’d use to top your taco salad! 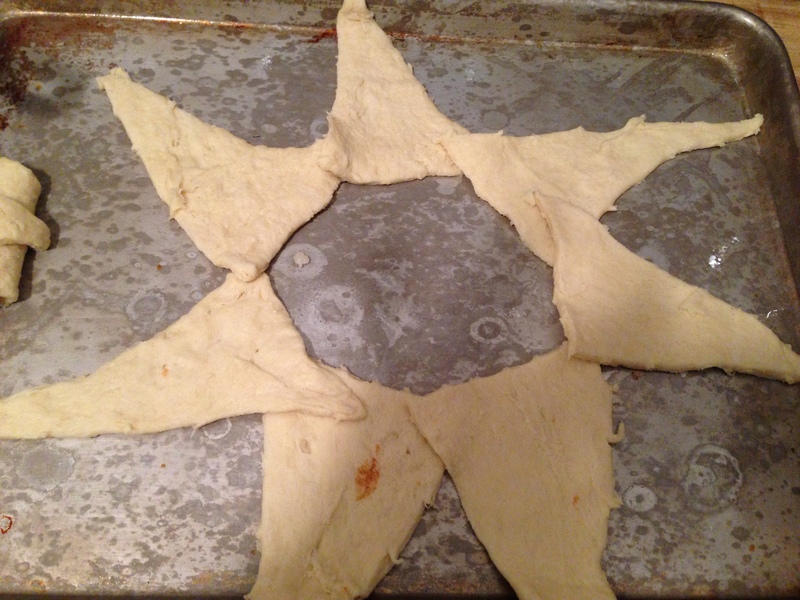 It’s a star! Sort of… So, I’d use two cans and have them overlap more next time. And then you cook according to the directions on the crescent roll container. 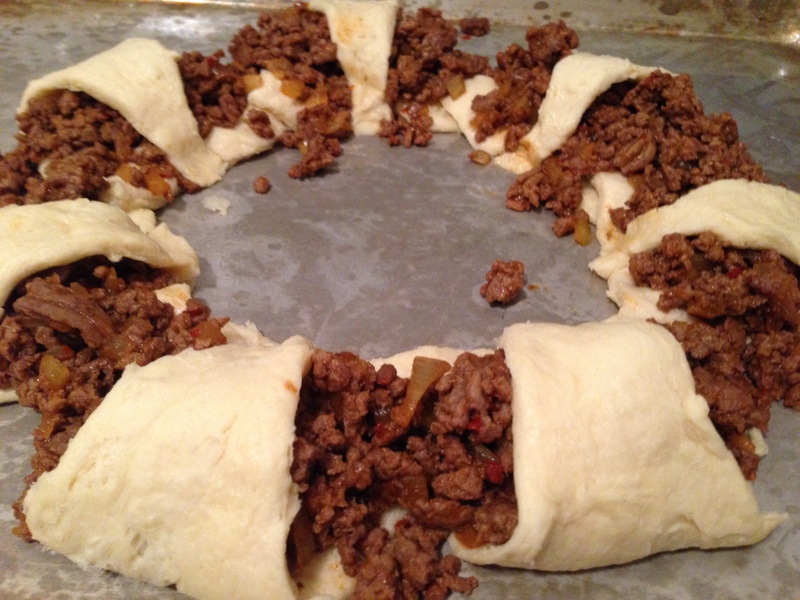 When the rolls are nice and browned, take them out, fill the middle of your ring with salad fixings… and TADA! a quick, warm, family (or roommate) friendly meal. And here’s what happened… As I was pulling out this quick dish from the oven, my roommate walked in and was so excited that dinner was on the table and ready to enjoy. And then got even MORE excited when she realized it was actually tasty dinner. Seconds? Yes please. Meanwhile, I took a bite and thought “oh my gawd it’s a taco seasoned Runza!” Which, as you all know, just made my heart sing with joy… all while getting me to think through how I should maybe reach out to Runza and let them know that I have a BRILLIANT new product line for them… I’ll probably become a millionaire. I’ll keep you posted on my progress on that front (read: you’ll never hear about this again because the idea will flop). Anywho, that friends, is the story of how I became a millionaire product inventor an adult. Wow. Only took 28 (nearly 29) years to get here! Yes. You read the title of this post correctly friends. I have fallen in love with a new adventure. Which, is where I’ve been for the last month. Kidding. I promise I’m not THAT big of a nerd. I’ve only spent like half the month doing that… the other half I just spent making fairly boring meals, starting training for Kate (yes friends that have met my beast, I’m learning to be a better dog owner, I’m SURE there will be stories about this in your near future) and spending lots of time at work on a massive project we just finished. 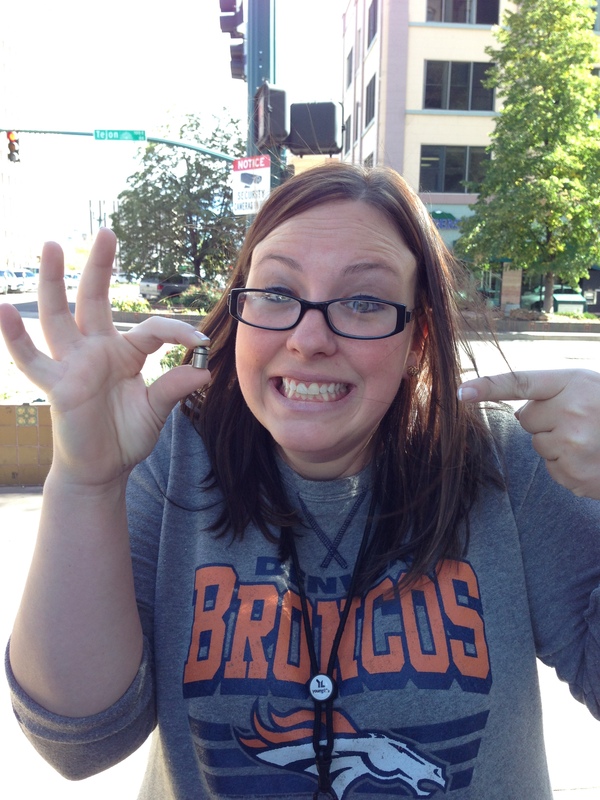 But let’s get back to the topic at hand… Geocaching. LOOK! They are so stinking tiny! You’d never know! It’s a log. It’s the cache. It means YOU’VE WON! Geocaching is this crazy hobby involving a compass, GPS coordinates, and a hint… and then you go adventure seek to find the cache. How adventurous you ask? 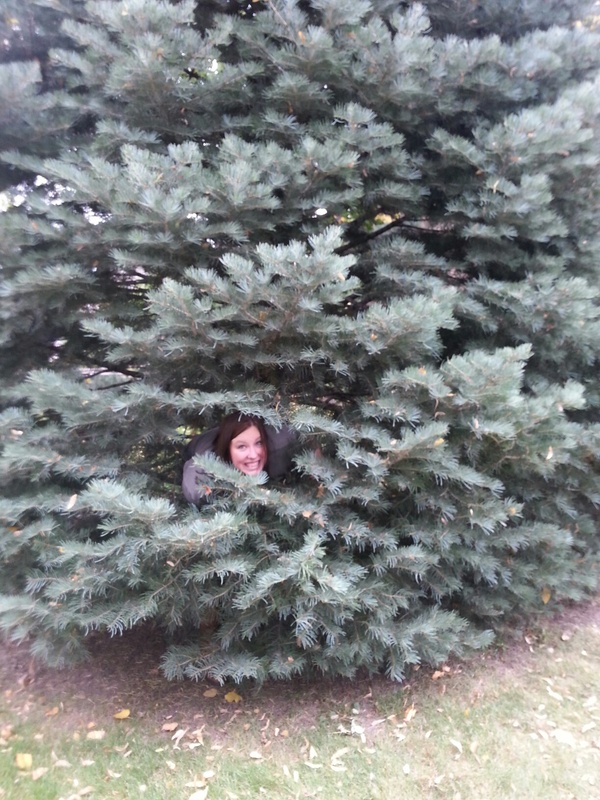 Well, sometimes, you just have to climb INTO trees to find them. Dedication. That’s what this little hobby takes. It was introduced to me by my lovely friend, and I’ve since passed the hobby along to another 5 people. True story. And now, I want to pass it to all of you. It’s something to get you out of the house (cool move Bets, right before winter), something that you can do with a friend or two to fill your time with adventures and laughs and also to just make you aware of hidden treasure in your own backyard. Because sometimes… these caches are filled with TRINKETS! Seriously, just when you didn’t think life could get any more exciting! So go to www.geocaching.com and I’ll let them teach you how it works (it’s simple and they make it simple). And then down load the App on your phone. Because as much as you’d like to think that you can handle it with a compass and an actual GPS, it’s a heck of a lot easier with just your phone (I mean, more power to you if you already own a GPS and a compass. You’re officially now my hero!). And then tell me about it. We can nerd out about the time we climbed into the tree like idiots together. And know, if you come and visit me in the near distant future… I might kidnap you and take you on an adventure. So – be prepared for that.